(paper2) Stano, P. et al. Semi-synthetic minimal cells as a tool for biochemical ICT. BioSystems 109, 24–34 (2012). (paper3) Stano, P. & Luisi, P. L. Semi-synthetic minimal cells: Origin and recent developments. Curr. Opin. Biotechnol. 24, 633–638 (2013). (paper4) Torino, D., Martini, L. & Mansy, S. S. Piecing Together Cell-like Systems. Curr. Org. Chem. 1751–1757 (2013). (paper5) Luisi, P. L. & Stano, P. Synthetic biology: Minimal cell mimicry. Nat. Chem. 3, 755–756 (2011). (paper6) Elowitz, M. & Lim, W. a. Build life to understand it. Nature 468, 889–890 (2010). (paper7) Caschera, F. & Noireaux, V. Integration of biological parts toward the synthesis of a minimal cell. Curr. Opin. Chem. Biol. 22, 85–91 (2014). (paper8) Fujiwara, Kei, and Nobuhide Doi. “Biochemical Preparation of Cell Extract for Cell-Free Protein Synthesis without Physical Disruption.” PLoS ONE 11, no. 4 (2016): 1–15. doi:10.1371/journal.pone.0154614. 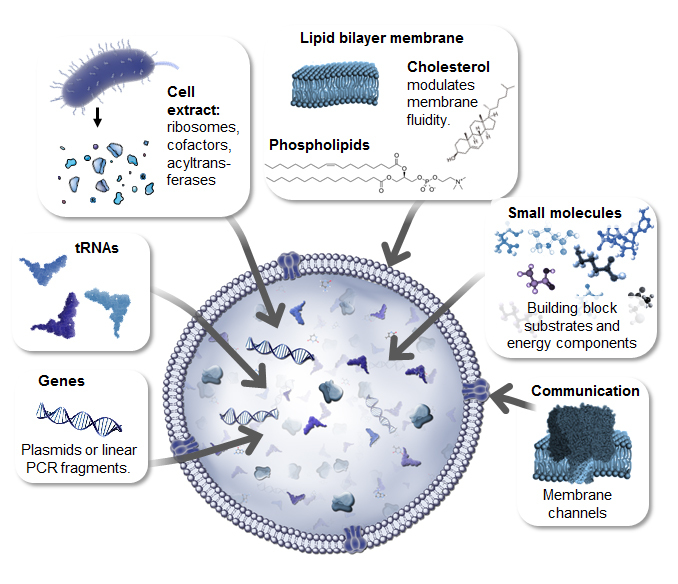 Synthetic minimal cells are bioreactors built to mimic certain aspects of cellular process-es – reconstitute specific genetic pathways, encapsulated within a lipid membrane. Thus, this technolo-gy combines most advantages of classical in vitro studies, while adding the capability to look at spatial interac-tions, interactions between many scaffolded and encapsulated proteins at once – providing some resemblance of the natural system. The synthetic minimal cell will never replace natural cell as an ultimate tool for compre-hensive studies of bio-logical processes. It can, however, be a versatile tool for bridging the gap between in vitro and in vivo studies, adding just enough complexity to make the system significantly more biologically relevant than classical in vitro studies, while keeping the complexity down to a minimum for ease of use, design and da-ta interpretation. The protein synthesis machinery used to build synthetic cells can come from eukaryotic or prokaryotic source, providing a choice between low cost, efficient expression of simple proteins (prokaryotic) and higher cost ex-pression of complex modified eukaryotic proteins. The type of protein expression system, cell-free transcription and translation systems, defines the kind fo experiments the particular syntheitc cell can be used for. Cell-free transcription and translation reactions allow synthesis of RNA and proteins in the absence of the rest of the cellular metabolism. The main advantage of this approach is that we can study RNA synthesis (transcription) and protein synthesis (translation) directly, without interference from the other reactions. The cloning of genes for use in the cell-free Tx-Tl is also simpler, so this technique is used for prototyping and troubleshooting protein expression in metabolic engineering and other areas where rapid iteration of protein expression conditions are beneficial. Cell-free systems are also used to model particular aspects of the cell, for example, to model one metabolic pathway or disease mechanism, without the interference/background of other processes in the cell. Below is a brief comparison of advantages and disadvantages of cell-free transcription and translation (Tx-Tl) vs. traditional expression of recombinant proteins in host organisms, using mostly bacterial and yeast expression as benchmark. Per volume and frequency of use, live-cell expression of recombinant proteins surpasses cell-free reactions by orders of magnitude. Live cell-based expression is used in biotechnology and medicine to produce known proteins for therapeutic and research applications. Cell-free protein expression is used for research application, in biotech for designing and prototyping novel pathways (for example, for metabolic engineering). Cell-free systems are also used to produce proteins that are difficult to purify in cell systems, for example membrane proteins or proteins that are very insoluble and thus tend to aggregate in cells. Cell-free expression systems may come as pre-made commercially available kits, or custom-developed and optimized lysates from bacterial or eukaryotic sources including, mammalian, wheat germ, yeast and insect sources. Different systems vary in yield, efficiency, ease and cost of use and the facility to introduce posttranslational modifications. The highest control over the translation process is possible using purified translation system of E.coli, the P.U.R.E. (Protein synthesis Using Recombinant Elements) system. This system has the disadvantages of lowest yields and high difficulty and cost, but it offers uniquely precise control and reproducibility, because all proteins involved in the synthesis are purified separately, and all cofactors, tRNA and substrates are added to the mix separately. This system allows the synthesis of modified proteins, changing genetic code and using unnatural amino acids. In contrasted to the P.U.R.E. system, whole-cell lysate extracts have been widely used - trading ease-of-use and significantly higher yields at a lower cost per reaction, for a lack of precise control over the components of the system (since each protein and small molecule is not purified independently). Both eukaryotic and prokaryotic systems are used as lysate sources, and the advantages and disadvantages of both have been characterized in nuanced detail elswhere. Generally, eukaryotic systems offer better folding and access to post-translational modifications, at the price of significantly lower yields. The prokaryotic system allows for higher yields at lower cost. If multi-domain proteins, complex signaling cascades or large proteins are needed, eukaryotic systems are typically preferable. Folding of large fusion proteins is much more efficient in eukaryotic systems, due to the presence of folding chaperones8, eukaryotic systems also offer much wider range of post-translational modifications than prokaryotic extracts. The bacterial extract, most commonly prepared from E.coli, is robust to changes in reaction temperature and tolerant to chemical additives, offering high yield of simple, unmodified proteins. Wheat germ extracts offer high yields at low cost, but like bacterial extracts, these systems offer no glycosidation or any other post-translational modifications, and can suffer from premature termination of translation. The insect cell-free protein synthesis can be prepared from many different species of moth or fly, offering the ability to translate large proteins while allowing limited protein glycosidation. The yeast cell-free protein synthesis system offers low cost, high yield synthesis of simple eukaryotic proteins, this system has been recently significantly improved, yet currently there are no commercially available kits. The unicellular protozoan Leishmania tarentolae is one of the most recently suggested sources of efficient, cheap, eukaryotic cell-free protein expression system, including eukaryotic translational and simple folding chaperones, yet it lacks more advanced post-translational machinery. There are few different mammalian cell-free protein synthesis systems available. The commercially available rabbit reticulocyte lysate offers cap-independent translation and contains mammalian folding chaperones. The glycosidation of proteins can be achieved in this system upon addition of canine microsomal membranes; this typically decreases overall yield of protein synthesis. Human HeLa cell extract is also commercially available, and it’s used to express antibodies, large and complex proteins and viruses. The bacterial transcription-translation mix is easier to prepare and less expensive than its eukaryotic counterpart, however it does not offer post-translational modifications, nor the ability to synthesize large, complex proteins. By contrast, the mammalian system is much more expensive to prepare and the protein yield is significantly lower, yet this system provide synthesis of long, complex proteins that require folding chaperones and post-translational modifications.26 Given the high cost and low protein yield of the insect and mammalian systems, the yeast extract has been proposed as a convenient middle-ground solution, maintaining the advantages of large scale preparation and eukaryotic folding chaperones. The transcription-translation extract is typically prepared from lysed cells. To achieve efficient protein synthesis inside synthetic cells, consumable substrates (amino acids, nucleotides) need to be supplemented. Notably, this is often also the case for the top-down approach of minimal biological cells, where the missing genes have robbed the original organism of its ability to synthesize nucleic and some amino acids which are spiked in the extra rich medium. Also, the energy source is often a limiting factor in cell-free, synthetic minimal cell-based transcription-translation reactions. Most typically, the energy substrate can be added into the mix prior to encapsulation inside the synthetic minimal cell, and robust methods of supplementing and enhancing availability of high-energy substrates in prokaryotic and eukaryotic systems have been developed. For instance, the ATP synthase complex expressed inside synthetic minimal cells provides recycling of the energy source during the reaction. Typically, the cytoplasmic fraction and ribosomes of a whole-cell extract are used together – providing chaperones and transcription factors and translation machinery from the same source. Recently a hybrid system was developed, with ribosomes and cytoplasmic fraction being purified separately, from different organisms, and combined for efficient protein synthesis reaction. Cell-free systems allow protein synthesis from linear PCR fragments. The minimal fragment contains the promotor (region that marks the initiation of transcription and translation), the gene of interest, and the terminator (region marking the end of translation) – and this is sufficient for expression of genes in cell-free Tx-Tl system. The ability to use short PCR fragments directly for protein synthesis is crucial for rapid discovery and prototyping of metabolic pathways, and studies of biological processes that include iterating multiple genes acting together. This is much faster than traditional molecular biology cloning techniques necessary when a whole circular plasmid is needed for expression in a live cell. Homework: Design an useful synthetic minimal cell. Design a system that can perform a function (biosensor, biomanufacturing, research - or any other purpose). Design all the steps of building and deploying the system: define function, pick components, describe results. Example solution to the SMC assignment, based on: Lentini, R. et al., 2014. Integrating artificial with natural cells to translate chemical messages that direct E. coli behaviour. Nature communications, 5(May), p.4012. The example answers are given in italic. To complete the homework, answer all questions. 1A) What would your synthetic cell do? What is the input and what is the output. Expand the sensing capacity of bacteria. Input: theophylline (inert to bacteria). Output of the SMC: IPTG. Output of the whole system: GFP produced in bacteria. Theophyline Aptamer reference: Martini, L. & Mansy, S.S., 2011. Cell-like systems with riboswitch controlled gene expression. Chemical Communications, 47(38), p.10734. 1B) Could this function be realized by cell free Tx/Tl alone, without encapsulation? No. If the IPTG was not encapsulated, it would go into the bacteria without the need of theophylline-induced membrane channel synthesis, thus the synthetic cell actuator would not exist. 1C) Could this function be realized by genetically modified natural cell? Yes, in this particular case: the theophylline aptamer could be incorporated into transformed gene. This lacks the generality though – it is easier to make SMC than modify bacteria, so in this system single bacteria reporter can be used to detect various small molecules. 1D) Describe the desired outcome of your synthetic cell operation. In presence of SMC, bacteria sense theophylline. 2) Design all components that would need to be part of your synthetic cell. 2A) What would be the membrane made of? 2B) What would you encapsulate inside? Enzymes, small molecules. 2C) Which organism your tx/tl system will come from? is bacterial OK, or do you need mammalian system for some reason? (hint: for example, if you want to use small molecule modulated promotors, like Tet-ON, you need mammalian system. Bacterial, because of the theophylline riboswitch used as SMC input. 2D) How will your synthetic cell communicate with the environment? (hints: are substrates permeable? or do you need to express membrane channel? The membrane is permeable to the input molecule (theophylline), the output is IPTG that will cross the membrane via the membrane pore created after theophyline-initiated gene expression. 3B) How will you measure the function of your system? Measure GFP output of the cells, via flow cytomertry. Alternatively, use enzymatic reporter, like luciferase, and measure bulk output of the enzyme. “A picture is worth a thousand words”. The entire homework could be done in one, detailed and annotated scheme showing all the components of your synthetic cell in desired operation. If possible, please include references (not only original papers, websites are OK too). Lab homework assignment: Express GFP in cell free system. plasmid P70-deGFP from Vincent Noireaux, same as used here: http://pubs.acs.org/doi/abs/10.1021/sb200016s OR other GFP expression vector under endogenous E.coli promotor like sigma 70. Please keep the enzyme mix frozen at all times - in -80 freezer or supplementing the dry ice until you&apos;re ready for experiment. Thaw the enzyme mix on ice (or in the fridge) immediately before use. Mix by gently pipetting up and down several times. Do not vortex. Incubate at 29-30C for minimum of 2 hours, ideally longer - 4h. Analyse GFP fluorescence immediately. The fluorescence of GFP can be analysed in the reaction mix, without purification. Use Nanodrop, or small volume cuvette fluorimeter. Scale appropriately if needed. Read "Biochemical Preparation of Cell Extract for Cell-Free Protein Synthesis without Physical Disruption", paper 8 in google drive. If you review the paper and decide dyou want to go ahead with the experiment, email Kate. You don&apos;t need to read it all. This is a list of possibly interesting papers, and sources for the theoretical intro above. Shimizu, Y. et al. Cell-free translation reconstituted with purified components. Nat. Biotechnol. 19, 751–5 (2001). Yollete V. Guillen Schlippe, Matthew C. T. Hartman, Kristopher Josephson, and J. W. S. In Vitro Selection of Highly Modified Cyclic Peptides That Act as Tight Binding Inhibitors. J. Am. Chem. Soc. 134, (2012). Hillebrecht, J. R. & Chong, S. A comparative study of protein synthesis in in vitro systems: from the prokaryotic reconstituted to the eukaryotic extract-based. BMC Biotechnol. 8, 58 (2008). Gagoski, D. et al. Performance Benchmarking of four cell-free protein expression systems. Biotechnol. Bioeng. 113, n/a–n/a (2015). Hino, M. et al. Efficiency of cell-free protein synthesis based on a crude cell extract from Escherichia coli, wheat germ, and rabbit reticulocytes. J. Biotechnol. 133, 183–189 (2008). Endo, Y. & Sawasaki, T. Cell-free expression systems for eukaryotic protein production. Curr. Opin. Biotechnol. 17, 373–380 (2006). Chang, H. C., Kaiser, C. M., Hartl, F. U. & Barral, J. M. De novo folding of GFP fusion proteins: High efficiency in eukaryotes but not in bacteria. J. Mol. Biol. 353, 397–409 (2005). Caschera, F. & Noireaux, V. A cost-effective polyphosphate-based metabolism fuels an all E. coli cell-free expression system. Metab. Eng. 27, 29–37 (2015). Liu, D. V., Zawada, J. F. & Swartz, J. R. Streamlining Escherichia Coli S30 extract preparation for economical cell-free protein synthesis. Biotechnol. Prog. 21, 460–465 (2005). Kigawa, T. et al. Preparation of Escherichia coli cell extract for highly productive cell-free protein expression. J Struct Funct Genomics 5, 63–68 (2004). Harbers, M. Wheat germ systems for cell-free protein expression. FEBS Lett. 588, 2762–2773 (2014). Madin, K., Sawasaki, T., Ogasawara, T. & Endo, Y. A highly efficient and robust cell-free protein synthesis system prepared from wheat embryos: plants apparently contain a suicide system directed at ribosomes. Proc. Natl. Acad. Sci. U. S. A. 97, 559–564 (2000). Ezure, T. et al. 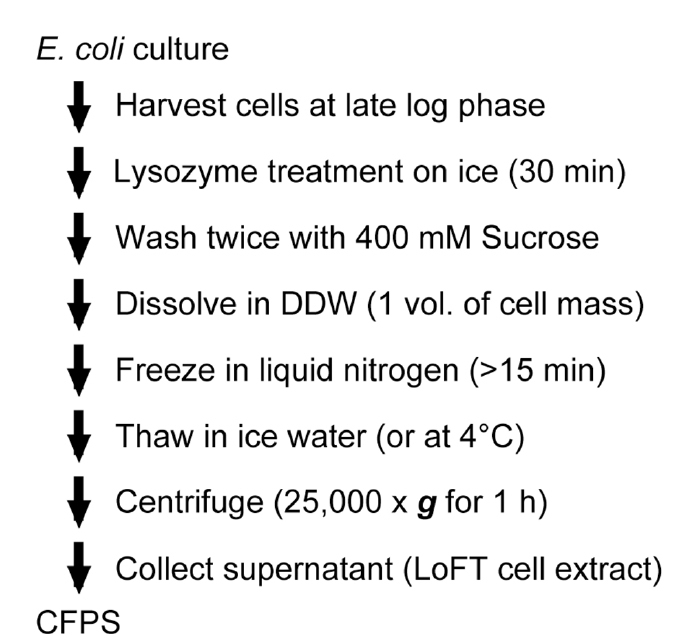 Cell-Free Protein Synthesis System Prepared from Hi5 Insect Cells by Freeze-Thawing. Biotechnol. Prog 22, 1570–1577 (2006). Swerdel, M. R. & Fallon, A. M. Cell-free translation in lysates from Spodoptera frugiperda (Lepidoptera: Noctuidae) cells. Comp. Biochem. Physiol. B. 93, 803–6 (1989). FOX, A. S., KAN, J., KANG, S. H. & WALLIS, B. Protein Synthesis in Cell-Free Preparations From Drosophila. J. Biol. Chem. 240, 2059–2065 (1965). Scott, M. P., Storti, R. V, Pardue, M. L. & Rich, a. Cell-free protein synthesis in lysates of Drosophila melanogaster cells. Biochemistry 18, 1588–1594 (1979). Schoborg, J. a., Hodgman, C. E., Anderson, M. J. & Jewett, M. C. Substrate replenishment and byproduct removal improve yeast cell-free protein synthesis. Biotechnol. J. 9, 630–640 (2014). Gan, R. & Jewett, M. C. A combined cell-free transcription-translation system from Saccharomyces cerevisiae for rapid and robust protein synthesis. Biotechnol. J. 9, 641–651 (2014). Kovtun, O. et al. Leishmania cell-free protein expression system. Methods 55, 58–64 (2011). Mikami, S., Kobayashi, T., Yokoyama, S. & Imataka, H. A hybridoma-based in vitro translation system that efficiently synthesizes glycoproteins. J. Biotechnol. 127, 65–78 (2006). Mikami, S., Kobayashi, T., Masutani, M., Yokoyama, S. & Imataka, H. A human cell-derived in vitro coupled transcription/translation system optimized for production of recombinant proteins. Protein Expr. Purif. 62, 190–198 (2008). Brödel, A. K. & Kubick, S. Developing cell-free protein synthesis systems: a focus on mammalian cells. Pharm. Bioprocess. 2, 339–348 (2014). Russ, Z. N. & Dueber, J. E. Cell-free protein synthesis: Search for the happy middle. Biotechnol. J. 9, 593–594 (2014). Pardee, K. et al. Paper-Based Synthetic Gene Networks. Cell 159, 940–954 (2014). Smith, M. T., Berkheimer, S. D., Werner, C. J. & Bundy, B. C. Lyophilized Escherichia coli-based cell-free systems for robust, high-density, long-term storage. Biotechniques 56, 186–93 (2014). Endoh, T. et al. Cell-free protein synthesis at high temperatures using the lysate of a hyperthermophile. J. Biotechnol. 126, 186–195 (2006). Hutchison, C. a. et al. Design and synthesis of a minimal bacterial genome. Science (80-. ). 351, aad6253–aad6253 (2016). Anderson, M. J., Stark, J. C., Hodgman, C. E. & Jewett, M. C. Energizing eukaryotic cell-free protein synthesis with glucose metabolism. FEBS Lett. 589, 1723–1727 (2015). Matthies, D. et al. Cell-free expression and assembly of ATP synthase. J. Mol. Biol. 413, 593–603 (2011). Panthu, B., Decimo, D., Balvay, L. & Ohlmann, T. In vitro translation in a hybrid cell free lysate with exogenous cellular ribosomes. Biochem. J. 398, 387–398 (2015).